A few months ago, I bought Rocksmith 2014 to fill my basics in guitar playing. My initial thought is that I will be able to practice while also playing a game (for the gamer that I am), and I was not disappointed. It’s fun as a game, but it also borders as a guitar learning software. Here are some of the features that made this a faster and fun way to learn guitar. Tracks – When you start a new game, you’ll be asked to choose which track of guitar playing are you planning to learn. The three options are Bass, Lead, and Rhythm. Each option will affect how the practice songs will be presented to you. The rhythm will be more focused on strumming the chords. Lead will be heavy on plucking. And bass will play the bass guitar part. Lesson Proper – The concept will be taught to you in a video lesson so you can imitate it with your own guitar. Trial Playthrough – Here, you’ll play a segment of musical notes that focuses on the chosen lesson. For example, if the lesson is about slides, then you’ll encounter notes that prompt you to slide from one fret to another. Practice – The last part will let you play a longer segment of musical notes. If you performed well by hitting around 90% of accuracy and technique, then the segment will transform into a more challenging sequence. With this, you will need to repeat the lesson (you can skip to the practice part) until you reach the lesson completion to 100%. Learn A Song – This is one of the features that make this an authentic video game. The format is just like the rhythm games you play in the arcades like Guitar Freaks and Rock Band except that it’s displaying the fret board of a guitar and not the orthodox three to five buttons. The camera moves accordingly so the transition from one note or chord to another is smooth and not obtrusive to your gaming experience. There are also more notations to remember since you’re dealing with chords, slides, pulls, hammers, etc., but you’ll get the hang of it if you go through the lessons. It also has tool called Riff Repeater. It lets you select a segment of the song that you want to practice. You can adjust the difficulty which will determine what notes you are going to play for that segment. Basically, the 100% difficulty is the actual chord of the song. The lower difficulties will transform it to an easier chord (e.g. barre chord becomes a power chord) or to a single note for the lowest setting. You’ll play this segment again and again until you hit all the notes right. After this, there’s an optional setting to increase the difficulty and replay the segment or proceed to play the next part of the song. To know more about the feature. See the guide video below. Guitarcade – These are minigames that practice the different parts of guitar playing. One game might test you in playing the scales while another game will test in regulating the volume of your strum. All games are presented in 8-bit retro style which is a lot of fun to play. It has leaderboards that submits your score via UPlay account. If you need a break from the lessons and songs, this is a good diversion while still practicing your guitar skills. Missions – This is your main guide on what to do next. It will also show the features that you possibly haven’t explored yet. There was one mission that required me to use the riff repeater, and from there I got my resolve that I could really learn each song because of this tool. This feature is also aided with markers that stick with the game’s menu items. 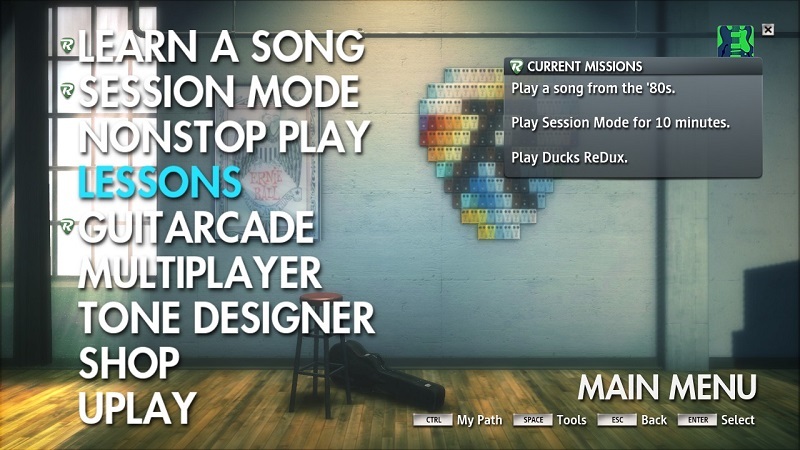 If you see the Rocksmith logo beside the session play, then it’s part of your current mission. Once you’ve fulfilled the requirement, the logo will be removed. It makes the entire learning process more intuitive. However, there are times that the mission may still seem unclear and will leave you wondering what you need to do. Don’t fret (pun-pun-pun). You can go to the forums and seek some advice. Chances are, that part is already resolved by your fellow players. If not, the community will be there to help you. 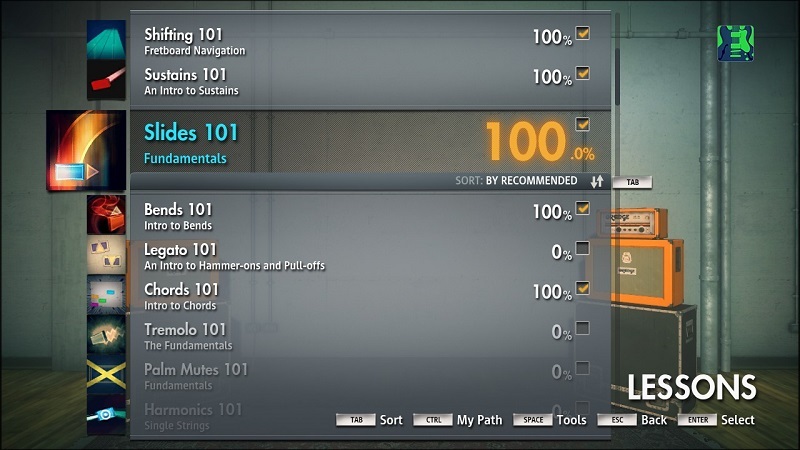 Missions will serve as your guide for all of Rocksmith’s features and learning path. You need an actual electric guitar, a copy of Rocksmith 2014 game, and a Rocksmith™ Real Tone Cable. If you buy the game on game shops, the copy is already bundled with the cable. If you buy the game from steam, you’ll have to buy the cable separately. Can I use my Steam account if I purchase the game from a game shop? Yes. The copy also comes with a key which you can redeem from steam. After installation, it will be added to your account’s library. You won’t need to insert the disc again. Can I use my acoustic guitar? YES. As long as it has a pickup where you can plug the Real Tone Cable. What guitar brands are supported by the game? Technically, it should support any brand, but I suggest that you use a mainstream brand like Epiphone. I’m currently using Yamaha EG112C. Can I plug other types of instruments? NO. You can only use a guitar. There’s actually a feature called Session Play that will let you play with a wide range of accompaniment based on the notes that you play, but all of the sounds will be provided by the game and not from an actual plugged instrument. The said feature is pretty impressive, and you can create a lot of possible combinations.